The innovative system eliminates the annoying problem of condensation in the kitchen. Falmec presents a new built-in technological solution with Virgola No-Drop model that combines aesthetic needs of linearity in the kitchen with the best Falmec technology. 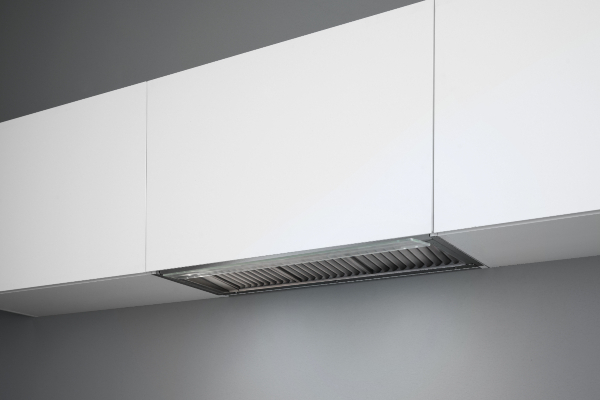 Virgola No-Drop efficiently faces the problem of dripping condensation, especially frequent when using induction hobs that do not have flames to reduce vapours. No-Drop System patented technology solves this problem that affects cooking activities and also furniture maintenance by using a selection of metal cross-bladed filters. They condense cooking vapours, that firstly glide through an inclined duct and then are collected in a dedicated compartment. Metallic filters, usually used to collect greases and oils derived from cooking, are disposed to capture every single particle of condensation and to direct it into a manifold that facilitates its collection and disposal. The surface of the filters are treated with an innovative technology which prevents the formation of drops from steam and fumes. It comes in three different sizes (60, 90 and 120cm), with a highly efficient 800 m3/h motor, 4 speed electronic control and dynamic LED light enabling you to adjust the hood light temperature to mirror the kitchen’s mood. Founded in 1981 in Vittorio Veneto (Treviso), Falmec is the leader brand in production of cookerhoods characterized by innovation in technology, contemporary design, excellent performances, prized materials, energy efficiency and 100% italian craftmanship. Through a multi-step process, which takes place entirely in the Vittorio Veneto plant, each single product is crafted up to the finest detail, with extreme precision and the utmost care in quality checking. The strong point of the brand is the ability to join the finest design and new technologies oriented to the highest performances, from low noise emission to air sanitization, essential factors in keeping the environment at home pleasantly healthy. What do you prefer in the kitchen? Choosing finishes helps define the look of the kitchen. Whether looking for matte or polished finishes, Abimis offers you both. The new saucepan collection by knIndustrie is inspired by the sheer pleasure of cooking. A sinuous and winning thought draws Kook, the Rastelli kitchen signed by the inspired Karim Rashid. Karan, iconic among the Rastelli collections, is the kitchen which is unmistakably signed by the designer Karim Rashid. www.ideashomegarden.com is the main meeting point for all of you who are looking for new ideas, from design and accessory, furniture, creative interior design, interesting gardens, fascinating architecture, the lifestyle themes that will not leave you indifferent. You will enjoy the hotels, resorts, spa & wellness centers, as well as restaurants around the world, the most exotic destinations, and often will take a peek in the homes of celebrities.